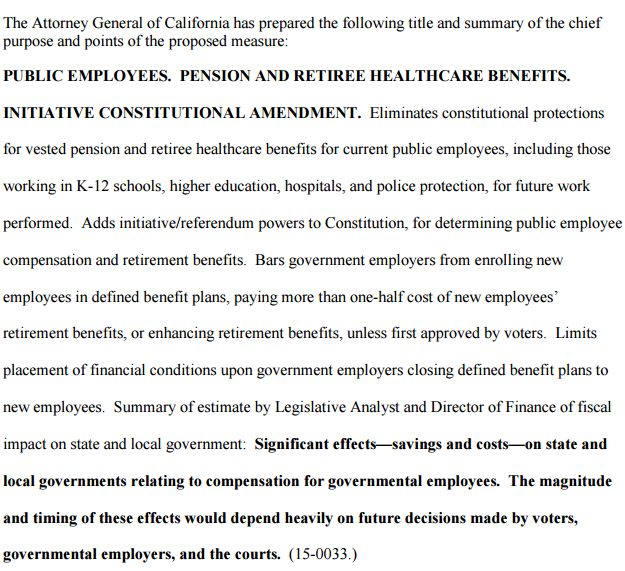 The authors of an initiative giving voters the power to decide whether new government employees get pensions said they will “commission a legal review” of the ballot summary issued yesterday by Attorney General Kamala Harris. Two previous pension reform initiatives were dropped after sponsors said Harris gave them ballot titles and summaries that were inaccurate and misleading, making voter approval unlikely. But a news release from the two leaders of a bipartisan group backing the new initiative, which is aimed at the November ballot next year, did not cite a specific problem with the Harris summary of the initiative. The initiative leaders previously have said they intended to file the initiative early to allow time for a legal challenge of the title and summary, if needed. Polling to see how the title and summary is received by voters also has been mentioned. 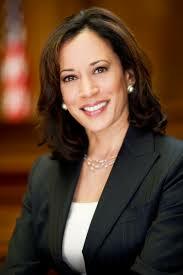 A coalition of public employee unions opposed to the initiative gave Harris, who is running for the U.S. Senate next year, some claim to the middle ground on her ballot summary by drawing fire from both sides. The elimination of death and disability benefits was used in television ads a decade ago that helped persuade former Gov. Arnold Schwarzenegger to drop his support for a measure to switch new state and local government employees to 401(k)-style plans. Reed dropped a different pension reform initiative last year after losing a court battle to change a Harris ballot summary. One of his complaints was that the summary “singles out a few specific public occupations” held in high regard by voters. But the new Harris summary repeats what once again may be the main issue. Another of Reed’s complaints last year was that the summary incorrectly said the initiative eliminates the vested pension rights of current workers. The rule results from a series of state court decisions widely believed to mean that the pension offered on the date of hire becomes a vested right, protected by contract law, that can only be cut if offset by a comparable new benefit. And it may be important to voters. A labor polling firm found that “California voters reject the idea of reducing or eliminating retirement benefits for current public employees,” calling it a “visceral negative response,“ the Sacramento Bee reported. Most pension reforms are limited to new hires, which takes years to yield savings. Cutting pensions earned by current workers in the future gets immediate savings, urgently sought by reformers who say pensions are taking money needed for other programs. Reed and the union coalition have already clashed over whether the new initiative would allow voters to reduce or eliminate pensions earned by current workers in the future, while protecting pensions already earned. Reed has argued that the new initiative is not intended to overturn the California rule. The union coalition disagrees, pointing to a provision that gives voters the right to determine the “compensation and retirement benefits” of government employees. The official analysis of the new initiative sent to Harris by nonpartisan Legislative Analyst Mac Taylor and Brown’s finance director, Michael Cohen, said the issue is unclear and could end up in the courts. The new initiative, the “Voter Empowerment Act of 2016,” would require voter approval of pensions for new state and local government employees hired on or after Jan. 1, 2019. Some of the other provisions in the initiative require voter approval of a government employer paying more than half the cost of retirement benefits for new employees and voter approval of any pension increase for current employees. “Costly government pension deals are devastating our public services — and this simple initiative gives voters the ability to stop sweetheart and unsustainable pension deals that politicians concoct behind closed doors with union bosses,” said the Reed-DeMaio news release. Low’s news release said: “While the (Harris) statement accurately reflects that this Tea Party-backed measure is a back-door way of repealing constitutionally-vested and promised rights to retirement security and health care and breaks contracts negotiated through collective bargaining, it falls far short of describing the chaos and uncertainty that would occur if it were to pass, including the undermining of the financial stability of the state’s major retirement systems. This entry was posted on August 12, 2015 at 7:29 am and is filed under Initiative. You can follow any responses to this entry through the RSS 2.0 feed. You can skip to the end and leave a response. Pinging is currently not allowed. At the very least …… in the 1-st sentence, the LAST 4 words “for future work performed” SHOULD HAVE followed the FIRST word “Eliminates”. I believe that this placement was intentional, not just poor sentence construction. Mr. Reed should, along with other issues he finds misleading, try to have a Judge order the correction noted.